Decorative Polymer Overlay comes with a 3 coat UV resistant clear gloss or satin finish. 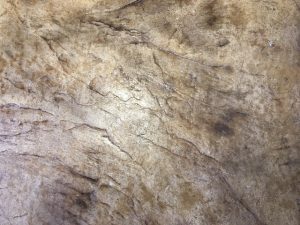 Stone Stamped Concrete Overlay is designed to transform existing concrete flooring into a seamless stone textured surface. We enrich the overlay with shadings of natural stone colour and then seal it with a UV resistant satin clear finish that can be sweated, mopped or vacuumed. And if it is an outdoor environment, it can be hosed down. Available in designer colour mixes or customised colour blends over a clear or coloured base. 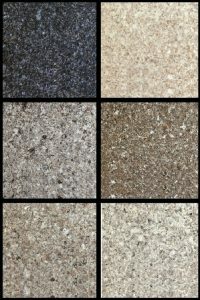 Coloured Flake (Chip) Flooring is one of the most versatile decorative finishes. Favourite for decades because of it’s serviceability and functionality. Suitable for interior & exterior applications with a smooth texture that can be made to various R grades of anti-slip. Florentina Spray Stone is a relatively new product introduction to the Australian market after huge success overseas. It is best described as a magnificent decorative coating with the appearance and texture of natural granite stone. This product is suitable for either indoors or outside concrete flooring surfaces always providing a stunning stone look without compromise. This is a stylish product suited to both residential and commercial applications. The ‘industrial’ look has become extremely popular in not only restaurants, cafes and retail outlets, but also in the home (inside or out). 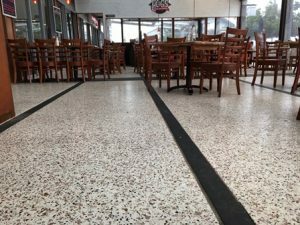 We take your new or old concrete floor and grind it just enough to give the clear epoxy seal coats something to hang on to. And the results will be even better if your old concrete has character …. because we know how to bring the best out of it. 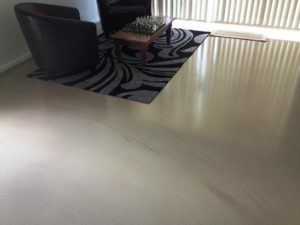 This process is available in a choice of gloss or satin clear. In addition to that, colour stains can also be added to create more character or just left if that’s how you like it.